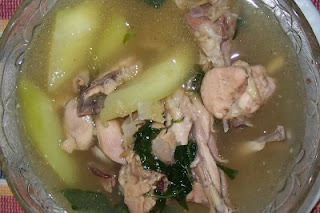 No Filipino kitchen is truly Filipino without having at least once prepared Chicken Tinola for lunch. This dish reminds me of Chicken Hainanese Rice, its main difference from the Singaporean dish being that Chicken Tinola's ingredients are all cooked together making a soup while with Chicken Hainanese, the whole dish is compartmentalized- the soup served in a separate bowl, the chicken in its own dish flanked with its accompanying vegetables, and the dipping sauce in another. In a carajay over medium heat, fry garlic in vegetable oil until golden brown. Add in onion and ginger root. When the onion is translucent, add in the chicken pieces. Cook for 10 minutes or until all the juices of the chicken comes out. In the meantime, shred the chili leaves from the stalk. Rinse and set aside. Cut off both ends of the papaya. Let the papaya stand on one end peel its skin with a knife. Cut the peeled papaya in half (lengthwise) and scoop out its seeds. Cut the papaya halves in two (lengthwise) then cut the quartered papaya horizontally approximately in 3/4in size thickness. After 20 minutes, add the sliced papaya in the chicken. Let simmer until the papaya is tender (about 8 minutes). Add the chili leaves. And let simmer for another 5 minutes. Serve with fish sauce (patis). And as with most Filipino dishes, Chicken Tinola is best enjoyed with hot steamed rice.